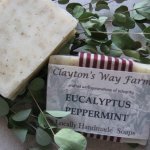 Truly a candy-dish peppermint smell, that will provide an invigorating shower, while leaving your skin super moisturized from the added shea butter and goat milk. As a homeopathic decongestant, this soap is worthy of having an extra bar kept on hand. Ingredients: Saponified coconut, palm, olive, soybean, grape seed, and castor oils. Shea butter, goats' milk & peppermint essential oil.